Yeah this is exactly what the description says. It's a strawberry pina colada gummy candy, and a phenomenal one. 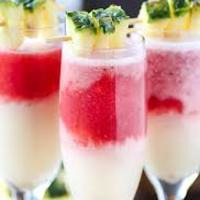 WF Pina Colada makes up most of the profile, it fills out the coconut blend and adds the thick candy texture. Then Graham bolstered the pineapple part with 2% WF Pineapple Candy, which is exactly what Pina Colada Candy needed. WF Strawberry Candy at 3% is just enough to add another fantastic candy layer without distracting from the main pina colada profile. I definitely recommend giving this a shot.